Testing Arctic climate models: how much detail can we capture? Many of us have heard that as a consequence of climate change, Arctic sea ice is rapidly decreasing and that the Arctic is warming twice as fast as the rest of the planet. It’s a complicated system that we don’t understand very well: few people live in the Arctic, and the data from limited study sites may not be representative of the region as a whole. How will Arctic climates change at different timescales in the coming years? What could this mean for coastal Arctic communities that rely on sea ice for preventing erosion or fishing in deep waters? How will navigation and shipping routes change? And in addition, how does a changing Arctic affect climates at lower latitudes? Visualization of winter sea ice in the Arctic by Cindy Starr, courtesy the NASA Scientific Visualization Studio. 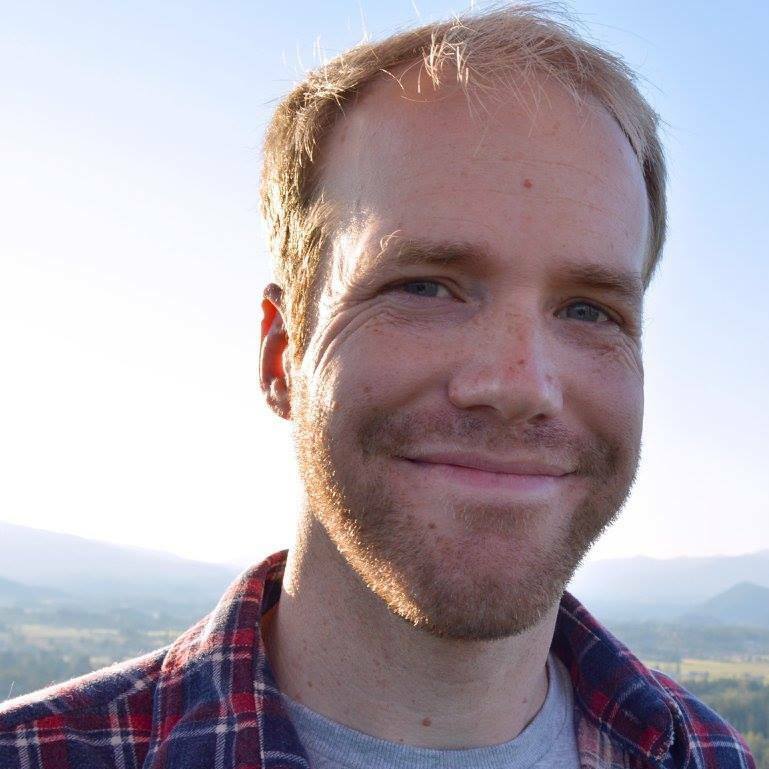 Daniel Watkins is a fourth-year PhD student of Atmospheric Science in OSU’s College of Earth, Ocean, and Atmospheric Science (CEOAS). Working with Dr. Jennifer Hutchings, he is analyzing climate model experiments in order to find answers to these questions. An important step in this is to evaluate the quality of climate simulations, which he does by matching up model output with real-life observations of temperature, sea ice, and cloud cover. Climate scientists have many models that predict how these factors will change in the Arctic over the next several decades. No model can take every detail into account, so how accurate can its predictions be? For example, the frigid Arctic temperatures can cause water molecules in low-lying clouds to trap heat in a very different way than they do here in the Pacific Northwest. Is it necessary to take a detail like this into account? In cold regions like the Arctic where surface ocean temperatures are much warmer than the overlying atmosphere, the ocean transfers a lot of heat into the air. Sea ice insulates the ocean and prevents heat transfer to the atmosphere, so when there is less ice, a cycle of increasing warming can perpetuate. Because water has a higher heat capacity than air, the ocean doesn’t cool off as much as the atmosphere warms. This is particularly bad news for the Arctic, where layers of cold, dense air often sit beneath warmer air in a phenomenon called a temperature inversion. Effectively, this prevents heat from moving on to higher layers of the atmosphere, so it stays low where it could melt more sea ice. This contributes to a phenomenon called Arctic Amplification, where for every degree of warming seen in the global average, the Arctic surface temperature warms by about four degrees. While it may be tempting to build a model containing every cloud in the atmosphere or chunk of ice in the Arctic Ocean, these could make it too computationally difficult to solve. Daniel has to simplify, because his goal is not to provide a weather forecast, but to evaluate how well models match observed measurements of Arctic temperatures. Daniel by the Skogafoss in Iceland in June 2018. If you’re lucky (and he was), you can see sea ice, turbulent boundary layer cloud layers, and the Greenland ice sheet when you fly between Portland and Iceland. To accomplish this, Daniel uses model output data, re-analyzed data that fits models to observations, and temperature measurements from weather balloons. These sources contain terabytes of data, so he has written code and contributed to open-source software that subsets and analyzes these datasets in a meaningful way. Daniel then uses the re-analyzed and weather balloon data to test whether the model reproduces various features of the Arctic climate, such as widespread temperature inversions. Working with this vast amount of information requires some mathematical prowess. While studying as an undergraduate at BYU Idaho, Daniel decided to major in math when he heard a professor describe mathematics as “a toolbox to solve science problems with”. An internship at Los Alamos National Laboratory later suggested geophysical modeling as a worthy task to tackle. When he’s not modeling the future of the Arctic, Daniel spends time with his children, Milo and Owen, and plays in a rock band he formed with his wife, Suzanne, called Mons La Hire. Daniel is also a DJ on KBVR and is excited to become the newest host of Inspiration Dissemination. To hear more, tune in on Sunday, December 2nd at 7 PM on KBVR 88.7 FM, live stream the show, or catch our podcast! This entry was posted in Atmospheric Science, Uncategorized and tagged Arctic, climate change on 2018-11-29 by klaseks. Can soil bacteria clean up our toxic messes? Thousands of sites across the US are contaminated with chemical solvents that have been used for decades in industrial processes. These solvents can leach into groundwater and create plumes up to several miles long. 1,4-dioxane, a probable human carcinogen, is often present in groundwater contaminant plumes because of its historical use in degreasing heavy machinery, but it’s also present in trace amounts in products as varied as laundry detergents, deicing agents, cosmetics, and even in food. There’s good news and bad news here: The Resource Conservation and Recovery Act, enacted in 1980, established laws for the management and disposal of hazardous wastes, meaning new releases to the environment have diminished considerably. Decontamination of chlorinated solvents often involves pumping groundwater to the surface and removing the contamination through volatilization or adsorption. However, this process is expensive, time- and energy-consuming, and ineffective at removing some chemicals, like water-soluble 1,4-dioxane. Some jobs require the help of friends. In this case, for Hannah Rolston, a fifth-year PhD student in the Department of Environmental Engineering working with Dr. Lewis Semprini, these friends are soil bacteria that are able to naturally degrade this carcinogen. Bioremediation, or the practice of putting these bacteria to work to degrade contaminants, offers some hope in cases like these. Sometimes they can degrade certain pollutants all by themselves (called natural attenuation), but when you’re dealing with carcinogens in areas with people nearby, you want to use an engineered approach to make sure this process goes as quickly and efficiently as possible. Hannah explained to us that not all compounds are easily degraded by bacteria, and even though some will consume 1,4-dioxane as food, environmental concentrations are not enough to sustain their growth (though remain harmful to humans). To work around this, she has been using a strategy called cometabolism. This involves adding a different carbon source into the groundwater plume for the microbes to eat–ideally, one that will cause the bacteria to produce enzymes that not only degrade the food source, but the 1,4-dioxane as well. This can be tricky, and not only in an engineering sense: you need to know enough microbial metabolism to be sure they’re not converting the hazardous compound into something even worse. Hannah collecting groundwater samples from test wells at the OSU motor pool. Using soil samples from two contaminated sites in Colorado and California, Hannah and the Semprini group are using isobutane (yes, the same gas you use for your camp stove) to nourish the native microbial communities so that they produce a type of enzyme called a monooxygenase. She has observed the 1,4-dioxane levels decrease in these enrichments. Preliminary work shows the bacteria convert 1,4-dioxane all the way to carbon dioxide–completely benign compared to what we started with. 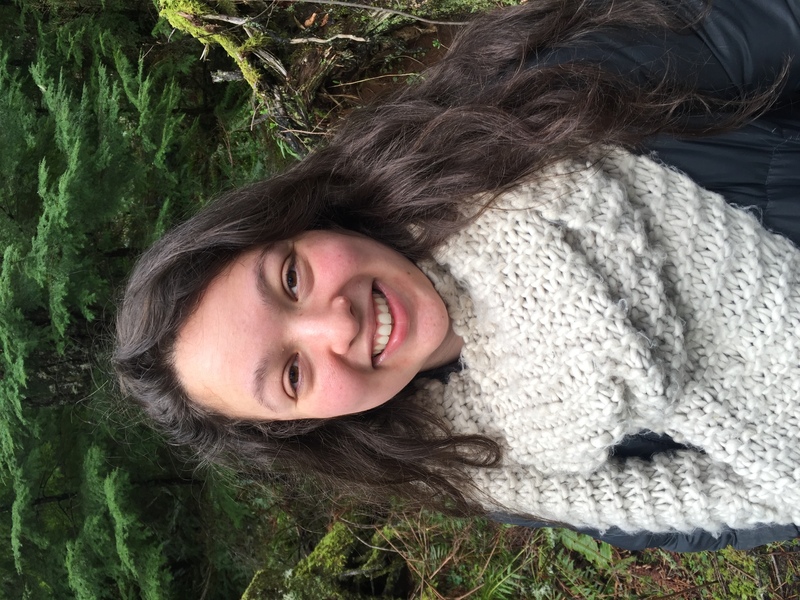 Hannah began her undergraduate at Seattle University as an international studies major interested in a career in diplomacy. Feeling her first year of humanities classes provided her a wide breadth of knowledge but didn’t give her applicable skills, she transferred to environmental engineering, where she became interested in groundwater and hazardous waste remediation. After graduation, she worked for the US Army Environmental Command, working with army installations across the country to comply with environmental regulations.. When the spreadsheets and desk work didn’t quite live up to its expectations, she knew it was time to seek out graduate programs where she could put her engineering background and interest in hazardous waste remediation to work. When she’s not tricking microbes into consuming carcinogenic contaminants, Hannah can be found road biking and doing ceramics at the OSU craft center. 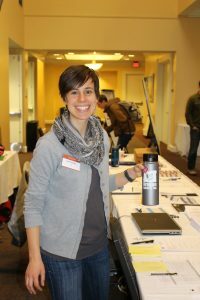 She is also involved in the OSU Chemical, Biological, and Environmental Engineering Graduate Student Association and the OMSI Science Communication Fellowship program. To hear more about her research and journey to graduate school, tune in to Inspiration Dissemination Sunday August 26th at 7pm on 88.7 FM, or stream the show live. This entry was posted in Environmental Engineering and tagged bioremediation, engineering, groundwater on 2018-08-24 by klaseks. All around us, plants, fungi, and bacteria are waging chemical warfare against one another to deter grazing, prevent against infection, or reduce the viability of competitor species. Us humans benefit from this. We use many of these compounds, called secondary metabolites, as antibiotics, medicines, painkillers, toxins, pigments, food additives, and more. We are nowhere close to finding all of these potentially useful compounds, particularly in marine environments where organisms can make very different types of chemicals. Could something as ordinary as a fungus from the sea provide us with the next big cancer breakthrough? Paige Mandelare thinks so. As a fourth-year PhD student working for Dr. Sandra Loesgen in OSU’s Chemistry department, she has extracted and characterized a class of secondary metabolites from a marine fungus, Aspergillus alliaceus, isolated from the tissues of an algae in the Mediterranean Sea. After growing the fungus in the laboratory and preparing an extract from it, she tested the extract on colon cancer and melanoma cell lines. It turned out to be cytotoxic to these cancer cells. Further purification of this mixture revealed three very similar forms of these new compounds they called allianthrones. Once Paige and her research group narrowed down their structures, they published their findings in the Journal of Natural Products. Next, she grew the fungus on a different salt media, replacing bromine for chlorine. This forced the fungus to produce brominated allianthrones, which have a slightly different activity than the original chlorinated ones. Her lab then sent two of these compounds to the National Cancer Institute, where they were tested on 60 cell lines and found to work most effectively on breast cancers. The recent publication of Paige in her story of the allianthrones from this marine-derived fungus, Aspergillus alliaceus.Like many organisms that produce them, this wonder mold only makes secondary metabolites when it has to. By stressing it with several different types of media in the lab, Paige is using a technique called metabolomics to see what other useful compounds it could produce. This will also give insight into how the fungus can be engineered to produce particular compounds of interest. A native Rhode Islander who moved to Florida at the age of ten, Paige has always been fascinated with the ocean and as a child dreamed of becoming a marine biologist and working with marine mammals. She studied biology with a pre-med track as an undergraduate at the University of North Florida before becoming fascinated with chemistry. Not only did this allow her to better appreciate her father’s chemistry PhD better, she joined a natural products research lab where she first learned to conduct fungal chemical assays. Instead of placing her on a pre-med career path, her mentors in the UNF Chemistry department fostered her interest in natural products and quickly put her in touch with Dr. Loesgen here at OSU. After finishing her PhD, Paige hopes to move back east to pursue a career in industry at a pharmaceutical company or startup. In the meantime, when she’s not discovering anticancer agents from marine fungi, she participates in a master swimming class for OSU faculty, trains for triathlons, and is an avid baker. To hear more about Paige and her research, tune in to KBVR Corvallis 88.7 FM this Sunday July 15th at 7 pm. You can also stream the live interview at kbvr.com/listen, or find it on our podcast next week on Apple Podcasts. This entry was posted in Chemistry, College of Science and tagged biology, Chemistry, ocean on 2018-07-11 by klaseks. Agroforestry, the practice of growing crops or tending livestock while purposefully managing trees on the same parcel of land, can provide security of fuel wood and food in rural areas of the developing world. Increased access to healthcare in many African countries has spurred population growth over the past couple of decades. Malnourishment remains a problem, and as the number of people per acre of farmland increases, maintaining food security may require changes in agricultural practices. 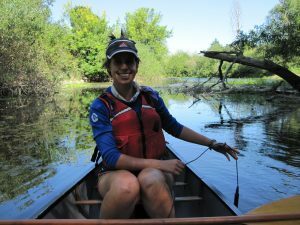 As a second-year PhD student in the Forest Ecosystems and Society department in the College of Forestry, Sonia Bruck knows this isn’t a simple task. Communities around the world who are exposed to agroforestry practices tend to adopt them at low rates, which often depend on residents’ wealth and education. 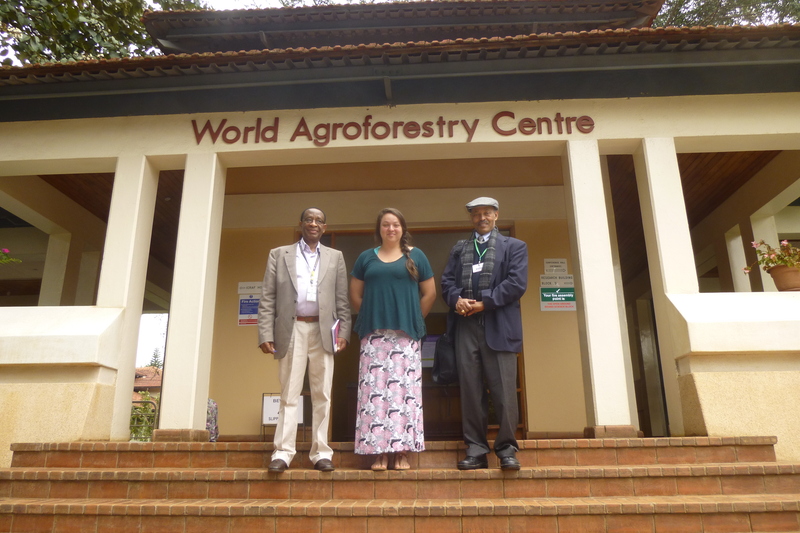 Working with the World Agroforestry Centre (ICRAF), a non-governmental organization in Kenya, Sonia will travel to the town of Mbola in the Uyui district of eastern Tanzania in September. She will be living there for seven months, examining how and why these and other factors might play a role in how people decide to adopt agroforestry practices. A Tanzanian regional office of ICRAF has already promoted the intercropping of pigeon pea and cassava with Gliricidia sepium (a nitrogen fixing tree), but despite this being a biologically sound strategy, it hasn’t caught on among everyone in Mbola. So if there are cultural or socioeconomic barriers to adopting these techniques, she wants to know about them. 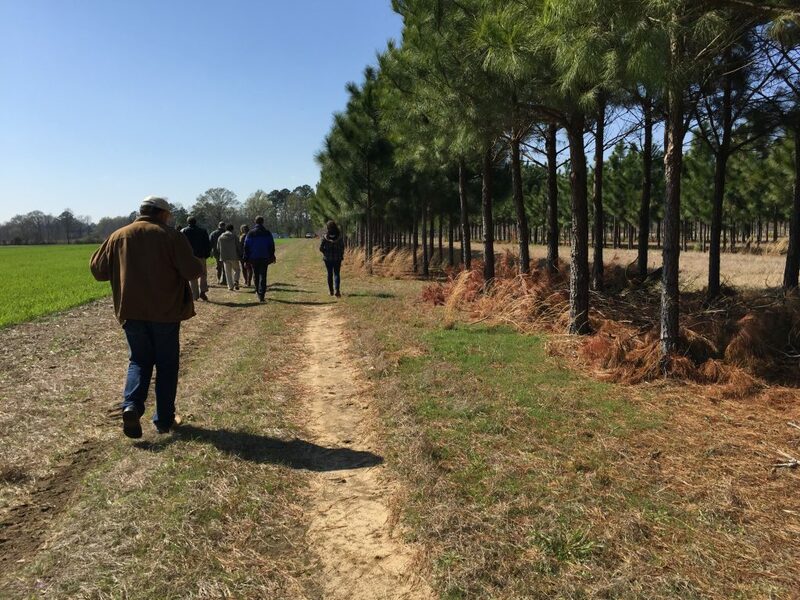 An agroforestry system in North Carolina – Longleaf pine alley cropping, where corn and soybeans were alternated near an open agricultural field. Knowing that wealthier villagers are able to place more risk into implementing a new agroforestry technique might be only one facet. Health, household division of labor, number of children per household, and access to food may also factor into whether people decide to adopt this strategy. Sonia is developing a quantitative survey to gather data like these, and plans to administer it to 600 residents once she arrives in Mbola. She will then analyze the survey data and schedule focus groups to allow residents to provide more context, especially if there are relationships between variables that don’t seem to make sense. According to rational choice theory, we’re all rational actors – so Westerners like us might be missing important cultural preferences that could guide farmers’ agricultural decisions in rural Tanzania. Sonia hopes that her findings will help ICRAF target households that could benefit from implementing agroforestry. (From left to right) Jeremais Mowo (Regional Coordinator for Eastern and Southern Africa), Sonia Bruck, and Badege Bishaw (her adviser) at ICRAF. When Sonia departs for Tanzania, she certainly will not be a stranger to international travel. Her father, a professor of plant pathology, taught a field course in the Peruvian Amazon, and she first got to tag along as a fourteen-year-old. The heat, humidity, and occasional threat of vampire bats didn’t seem to deter her when she studied abroad for a summer in Brazil, as an undergraduate at Appalachian State University majoring in Sustainable Development and Environmental Studies. She has also traveled extensively across Central and South America, and recently to the Philippines, Thailand, and Nepal to catch up with friends stationed in the Peace Corps and learn more about local cultures. To hear more about Sonia’s research and experiences traveling and living abroad, be sure to tune in to KBVR Corvallis 88.7 FM this Sunday May, 27 at 7 pm, stream the live interview at kbvr.com/listen, or find it in podcast form next week on Apple Podcasts. This entry was posted in College of Forestry and tagged Agriculture, Environmental Sciences, Forestry on 2018-05-25 by klaseks. When we hear news coverage of global environmental changes, it can easily overwhelm us. We mentally curl up into the fetal position and conclude there is nothing we can do to stave off the changes that Earth is projected to experience. One of these changes is ocean acidification–a phenomenon where carbon dioxide in the atmosphere is absorbed by the ocean. As carbon dioxide levels increase in our atmosphere, more of it is able to dissolve into the ocean and lower its pH, making it more acidic. A decrease of 0.1 pH unit in the global ocean since the beginning of the 1900s may not seem like a lot, but because pH is represented on a logarithmic scale, it actually represents about a 30% increase in hydrogen ions. This makes it harder for organisms like oysters, clams, and corals to build hard shells and skeletons. It is uncertain how this phenomenon could affect the long-term fate of these organisms, as well as the fish that depend on them. Brian flying in a hot air balloon north of Mt. Rainer, WA. This is where Brian Erickson comes in. Brian, a masters student in Marine Resource Management in OSU’s College of Earth, Ocean, and Atmospheric Science, observed that most curricula designed to teach high school students about ocean acidification do not discuss actionable solutions that most people can take in their everyday lives to mitigate their carbon footprints. Do student attitudes change when presented with solutions like insulating homes to save on heat, swapping incandescent bulbs with LEDs, or consolidating trips to the store to minimize gas consumption? Brian at work during his first field biology job, studying the sexual reproduction of tropical seaweeds in St. Croix, U.S. Virgin Islands and San Blas, Panama. It’s easy to fall in love with the ocean when you snorkel on coral reefs for two summers! 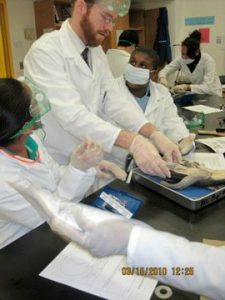 A former high school science teacher himself, Brian grew up in St. Louis and received his undergraduate degree in biology from Lewis and Clark College. 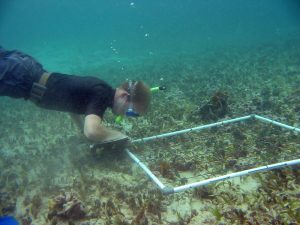 As an undergraduate, he first became acquainted with environmental research as a field technician in St. Croix in the Caribbean. After participating in Teach For America in New York City, he took many environmental research and education jobs before deciding to return to the ocean to bridge his interests of outdoor education and social science. As his masters draws to a close, Brian will be staying at OSU to begin a PhD in Fisheries and Wildlife working to bring multiple perspectives to marine conservation efforts in East Africa. Helping students dissect a shark at Bronx Career & College Preparatory High School (Bronx, NY). 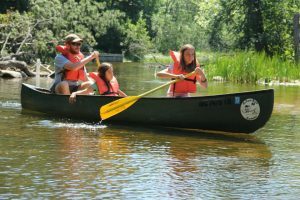 Taking students on their first canoe trip with Parks in Focus near Pictured Rocks, MI. To hear more about Brian’s research and experiences in education, tune in to KBVR Corvallis 88.7 FM at 7 pm on April 15th, or stream it online here. If you’re busy at that time, the show will appear on our podcast later this week. This entry was posted in College of Earth Oceanic and Atmospheric Sciences, Marine Resource Management on 2018-04-13 by klaseks. How can humans help oysters adapt to stresses from ocean acidification? The Pacific Northwest supports a 270 million dollar per year shellfish industry. Human-induced climate change has increased global levels of atmospheric carbon dioxide. More carbon dioxide then enters ocean water, making it more corrosive. As a consequence, oysters and other shellfish that rely on alkaline seawater conditions to precipitate calcium carbonate and build their shells find it harder to grow. The Whiskey Creek Shellfish Hatchery in Tillamook, which supplies Netarts Bay with oysters and also sells larvae to farmers across the Northwest, experienced larval die-offs of nearly 75% in 2007. OSU’s College of Earth, Ocean and Atmospheric Science, is working on an unusual new way of growing oysters in Netarts Bay. She is placing large bags of dead oyster shells in the bay and then growing oysters on top of them. Similar to antacids, dead oyster shells neutralize corrosivity in the water by dissolving into carbonate, which the live oysters can then incorporate into their shells. Think of it as a short-circuited version of the circle of life. 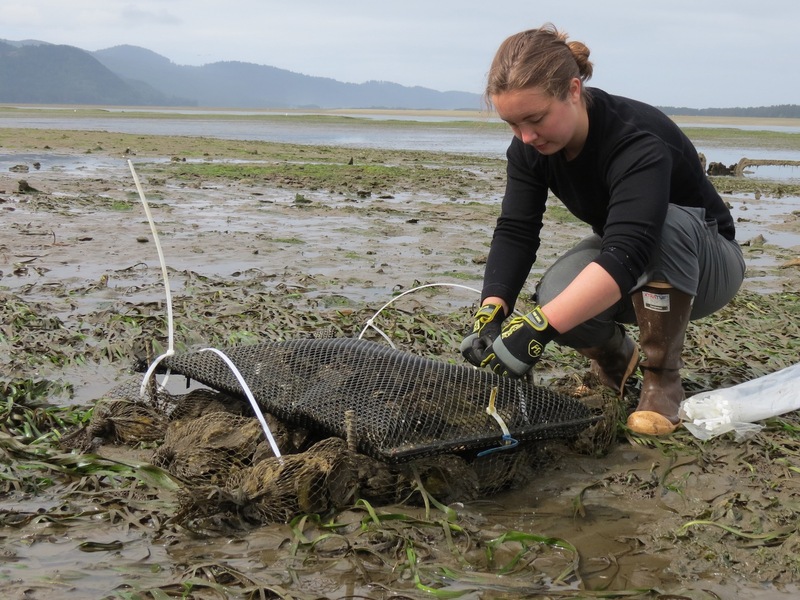 Sophie attaching predator bags to shell plantings in Netarts Bay. Photo credit Tiffany Woods, Oregon Sea Grant. Spat on shell, or baby oysters that have attached to old dead oyster shells. These are what the oysters looked like at the start of the project in August 2015. Now each of those little brown spots are around 9 cm (~3.5 in). Photo Credit Sophie Wensman. Besides investigating how these oysters will grow, Sophie plans on using her background in chemistry to develop a technique to examine how ocean chemistry is recorded in the oysters shells, layer by layer. Like all of us, oysters are not perfect. Besides calcium carbonate, they incorporate some impurities into their shells, like certain forms of uranium carbonates. Based on what we know about forams, sea-dwelling zooplankton that also mineralize calcium carbonate shells, Sophie expects the amount of uranium the oysters mineralize will increase under more corrosive conditions, where less carbonate is available. To accomplish this, she will use a technique called laser ablation mass spectrometry, where she will shoot lasers onto samples of oyster shells. The shell bits will vaporize, and the machine will record the amounts of uranium and calcium present. 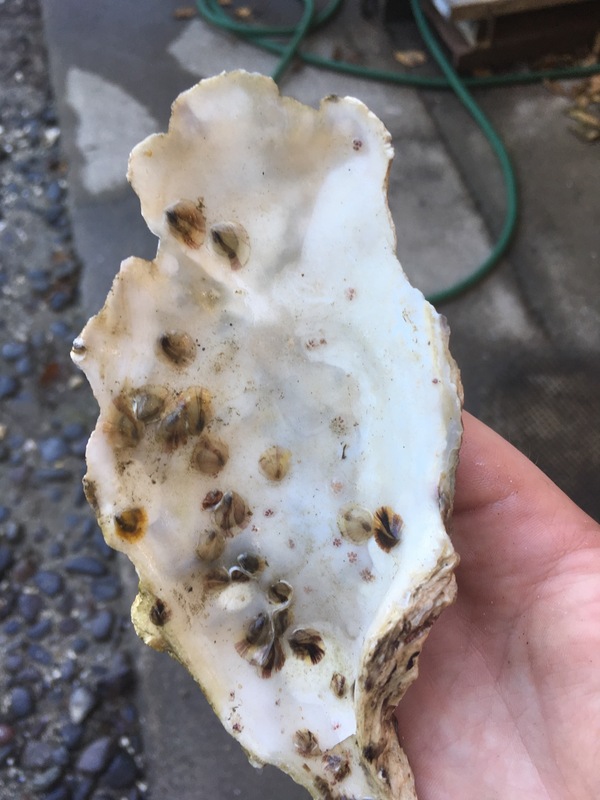 Looking at this uranium-to-calcium ratio and how it relates to the measured seawater chemistry in Netarts Bay could be helpful for other oyster growers to see whether their animals are also experiencing stress from ocean acidification. Adult oyster shell that has been cut in half to expose the hinge of the shell (left). This hinge is what we are using to trace water chemistry in Netarts Bay. Photo credit Tiffany Woods, Oregon Sea Grant. Sophie’s mother, who home-schooled her until the age of twelve, instilled in her a curiosity about science and the natural world from a young age. At the age of eight, Sophie became the youngest Marine Docent through the University of New Hampshire’s Sea Grant program. She also worked as a rocky shore naturalist and camp counselor at the Seacoast Science Center in Rye, NH, teaching people of all ages about the rocky shore ecosystem. 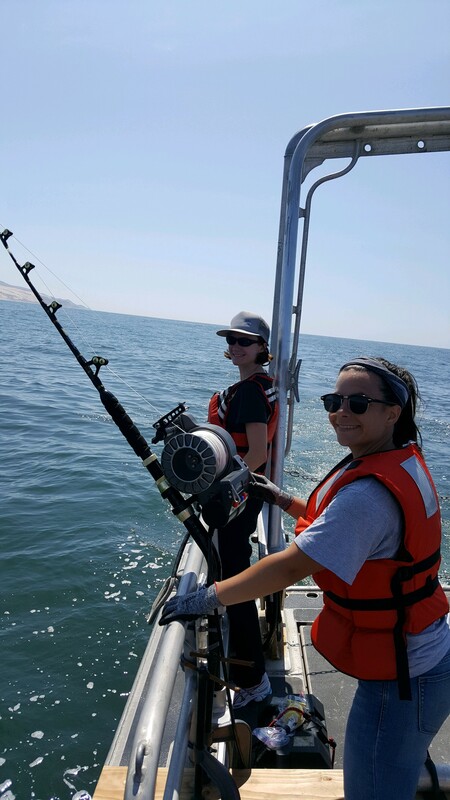 Sophie attended the University of Michigan studying secondary science education, but interning with Dow Corning and stumbling across an interview with a chemical oceanographer on the Discovery Channel’s Shark Week program provided her another career idea. 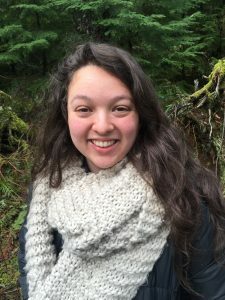 This led her to an NSF-sponsored Research Experience as an Undergrad (REU) program at the University of Washington, a 36-day research cruise between Hawaii and Alaska, and a job as a technician in Joel Blum’s lab at the University of Michigan studying mercury isotope geochemistry. Sophie intends to continue her passions of education and chemical oceanography by pursuing an academic position at a research university. Tune in to 88.7 FM at 7:00 pm Sunday evening to hear more about Sophie and her research on oyster health and chemistry, or stream the program live right here. You can download her iTunes Podcast Episode! This entry was posted in Fisheries and Wildlife on 2018-02-04 by klaseks. Ocean basins are like trumpets– no, really. We’re all familiar with waves when we go to the coast and see them wash onto the beach. But since ocean waters are usually stratified by density, with warmer fresher waters on top of colder, saltier ones, waves can occur between water layers of different densities at depths up to hundreds of meters. These are called internal waves. They often have frequencies that are synched with the tides and can be pretty big–up to 200 meters in amplitude! Because of their immense size, these waves help transfer heat and nutrients from deep waters, meaning they have an impact on ocean current circulation and the growth of phytoplankton. The line of foam on the surface of the ocean indicates the presence of an internal wave. We still don’t understand a lot about how these waves work. Jenny Thomas is a PhD student working with Jim Lerczak in Physical Oceanography in CEOAS (OSU’s College of Earth, Ocean, and Atmospheric Sciences). Jenny studies the behavior of internal waves whose frequencies correspond with the tides (called internal tides) in ocean basins. This requires a bit of mathematical theory about how waves work, and some modeling of the dimensions of the basin and how it could affect the height of tides onshore. Picture a bathtub with water in it. Say you push it back and forth at a certain rate until all the water sloshes up on one side while the water is low on the other side. In physics terms, you have pushed the water in the bathtub at one of its resonant frequencies to make all of it behave as a single wave. This is called being in a normal mode of motion. Jenny’s work on the normal modes of ocean basins suggests that the length-to-width ratio and the bathymetry of an ocean basin influence the structure of internal tides along the coast. Basically, if the tidal forcing and the shape of the basin coincide just right, they can excite a normal mode. The internal wave can then act like water in a bathtub sloshing up the side, pushing up on the lower-density water above it. It turns out that water isn’t the only thing that can have normal modes. The air column in a wind instrument is another example. Jenny grew up a child of two musicians and earned a degree in trumpet performance from the University of Iowa, and she occasionally uses her trumpet to demonstrate the concept of normal modes. She can change pitches by buzzing her lips at different resonant frequencies of the trumpet–the pitch is not just controlled by the valves. Jenny uses her trumpet to explain normal modes. Near the end of her undergraduate degree at the University of Iowa, Jenny discovered that she had a condition called fibrous dysplasia that could potentially cause her mouth to become paralyzed. Deciding a career as a musician would be too risky, and realizing her aptitude for math and physics, she went back to school and earned a second undergraduate degree in physical oceanography at Old Dominion University. After a summer internship at Woods Hole Oceanographic Institution conducting fieldwork for the US Geological Survey, she decided to pursue a graduate degree at OSU to further examine the behavior of internal waves. Tune in to 88.7 KBVR Corvallis to hear more about Jenny’s research and background (with a trumpet demo!) or stream the show live right here. You can also download Jenny’s iTunes Podcast Episode! Jenny helps prepare an instrument that will be lowered into the water to determine the density of ocean layers. Jenny isn’t fishing. The instrument she is deploying is called a CTD for Conductivity, Temperature, and Depth–the three things it measures when in the water. This entry was posted in College of Earth Oceanic and Atmospheric Sciences, Physical Oceanography, Uncategorized and tagged Oceanography, Physics, Waves on 2017-11-18 by klaseks. In the cold, dark depths of the seafloor across the world, microbes living in sediments and on rocks are quietly breaking down organic material and sucking dissolved oxygen out of the seawater. The continental shelf off of Oregon’s coasts, home to a fishing industry that brings in over a hundred million dollars of revenue per year, is no exception. Does oxygen consumption, and therefore carbon cycling, vary by location, or across seasons? 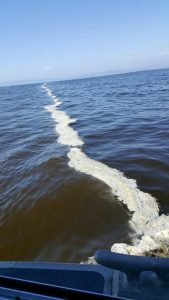 Setting a baseline to investigate these patterns of oxygen drawdown is crucial to understanding habitats and distributions of fish stocks, but will also establish what “normal” oxygen consumption looks like off our shores. Measurements like these are also used by the Intergovernmental Panel on Climate Change (IPCC) to estimate global patterns of carbon burial. If any forces were to shift these patterns in the future, we’d at least have a baseline to allow us to diagnose any “abnormal” conditions. Peter Chace is a third-year PhD student of Ocean Ecology and Biogeochemistry in the College of Earth, Ocean, and Atmospheric Sciences (CEOAS). 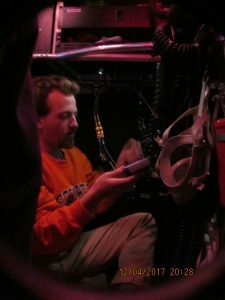 Peter’s research focuses on developing a technique of measuring fluxes of oxygen across the seafloor called Eddy covariance. This technique takes high-resolution time measurements of three-dimensional velocities of water moving in turbulent whorls, or random circular patterns, within the boundary layer of a fluid like air or water. 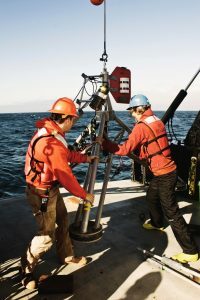 Eddy covariance has been employed to measure fluxes across air layers on land for decades, but has only recently been applied in marine systems. A point-source oxygen measurement within this turbulent layer is measured with a microelectrode and combined with the velocity data to develop a flux. Why go through all this trouble? Other ways to measure oxygen fluxes, like putting chambers over an area of seafloor and waiting to measure an oxygen drawdown, require a lot of work and give little temporal resolution. Workers on the RV Oceanus, Oregon State’s largest research vessel, deploy a benthic (seafloor) oxygen sensor. Peter can calibrate his microelectrodes to measure other chemicals and obtain their fluxes across the seabed, but he is mainly focused on oxygen. 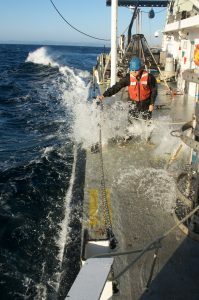 To measure fluxes off the Oregon coast, Pete and his advisor, Dr. Clare Reimers, will head to sea on the RV Oceanus several times this fall and winter to deploy their sensor on the seafloor for days at a time. 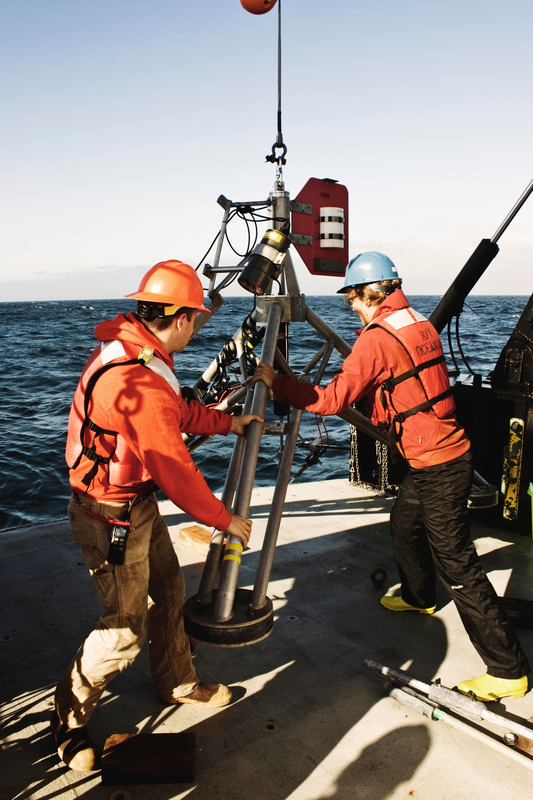 The desk-sized seafloor lander and the microelectrode attached to it are fragile, and the rough seas offshore Oregon in fall and winter will make it a challenging endeavor. We hope they pack enough seasickness medication and barf bags! You get right up close and personal with the ocean when you send down these instruments… and this is on a clear day with calm seas! Since growing up as a child in New Jersey, Peter has always wanted to learn about the ocean. While studying chemistry and marine biology at Monmouth University (in New Jersey) as an undergraduate, he completed a summer REU (Research Experience as an Undergraduate) with his current advisor, Clare Reimers, here at Oregon State University. He also interned for NOAA (the National Oceanic and Atmospheric Association), analyzing the chemistry of hydrothermal vent fluids with Dr. David Butterfield. Pete revisited a hydrothermal system on a cruise to the East Pacific Rise off of Central America where he got a remarkable opportunity to dive in Alvin, the submersible that discovered the wreckage of the Titanic. 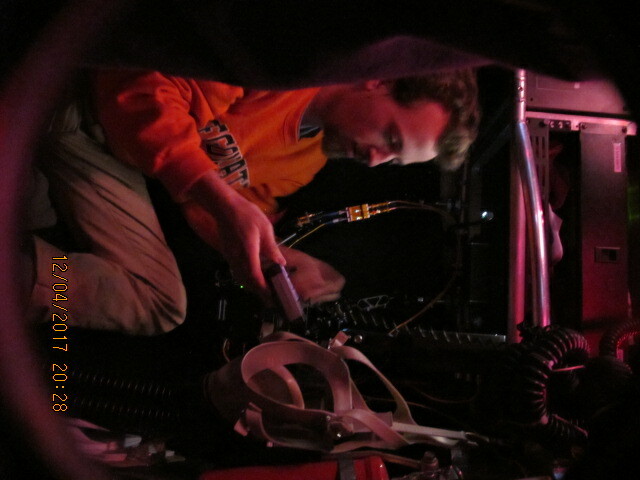 Here’s Pete in the submersible Alvin just before the dive, checking his microelectrodes. To hear more about Peter’s research on sensor development and his seafaring expeditions, tune in to Inspiration Dissemination on Sunday, October 15th at 7pm on 88.7 KBVR Corvallis. Or stream it online here! This entry was posted in College of Earth Oceanic and Atmospheric Sciences, Uncategorized on 2017-10-14 by klaseks. Characterizing off-channel habitats in the Willamette River: Fish need to cool off too! During the summer, when the mercury clears triple digits on the Fahrenheit scale, people seek out cooler spaces. Shaded parks, air conditioned ice cream parlors, and community pools are often top places to beat the heat. If you’re a resident of Corvallis, Oregon, you may head downtown to dip your toes in the Willamette River. Yet while the river offers a break from the hot temperatures for us, it is much too warm for the cold water fishes that call it home. Where do fish go to cool off? 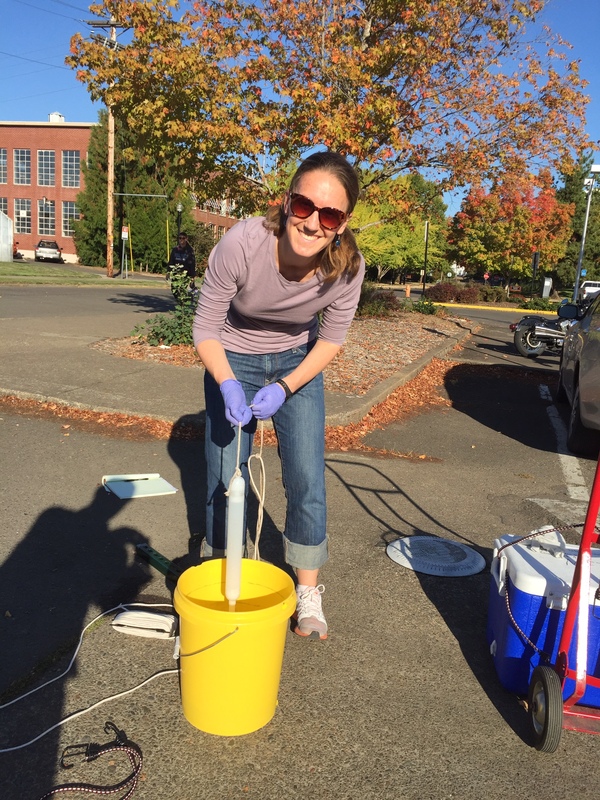 As a master’s student in the Water Resources Graduate Program at Oregon State University, Carolyn Gombert is working to understand where cold water habitat is located along the Willamette River. More importantly, she is seeking to understand the riverine and geomorphic processes responsible for creating the fishes’ version of our air conditioned ice cream parlors. By placing waterproof temperature loggers along sites in the upper Willamette, she hopes to shed light both on the temporal and spatial distribution of cold water patches, as well as the creation mechanisms behind such habitats. Because the Willamette Basin is home to Cutthroat trout and Chinook salmon, the river is subject to the temperature standard adopted by the state of Oregon in 2003. Between May through October, Cutthroat and Chinook require water cooler than 18 degrees Celsius (64.4 degrees Fahrenheit). Currently, the main channel of the Willamette regularly exceeds this threshold. The coolest water during this time is found in side channels or alcoves off the main stem. While Oregon law recognizes the benefits these “cold water refuges” can provide, our scientific understanding of how these features change over time is still in its early stages. Data collection for Carolyn’s project is slated to wrap up during September of 2017. However, preliminary results from temperature monitoring efforts suggest the subsurface flow of river water through gravel and sediment plays a critical role in determining water temperature. 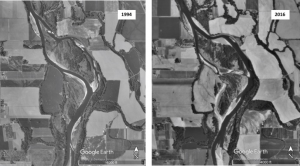 By pairing results from summer field work with historical data such as air photos and laser-based mapping techniques (LiDAR) like in the image below, it will be possible to link geomorphic change on the Willamette to its current temperature distributions. 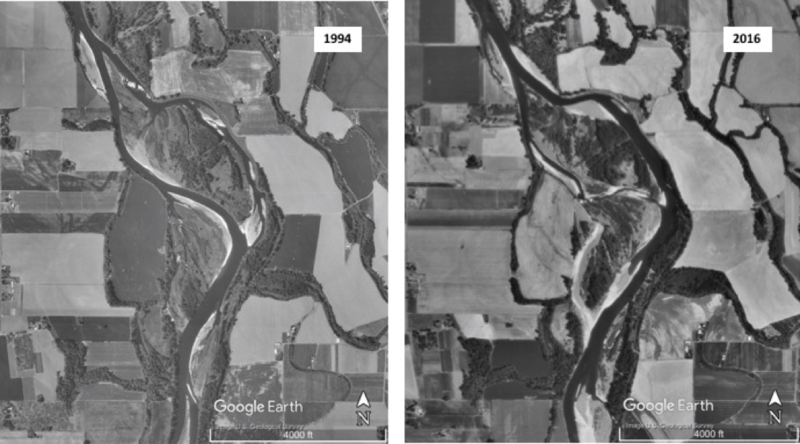 Between 1994 and 2000, the Willamette River near Harrisburg, Oregon shifted from a path along the left bank to one along the right bank. This avulsion would have happened during a high flow event, likely the 1996 flood. Prior to beginning her work in hydrology at OSU, Carolyn earned a bachelor’s in English and taught reading at the middle school level. Her undergraduate work in creative writing neither taught her how to convert temperature units from Fahrenheit to Celsius nor how to maneuver in a canoe. But the time she spent crafting stories did show her that characters are not to be forced into a plot, much like data is not to be forced into a pre-meditated conclusion. Being fortunate enough to work with Stephen Lancaster as a primary advisor, Carolyn looks forward to exploring the subtleties that surface from the summer’s data. If you’d like to hear more about the results from Carolyn’s work, she will be at the OSU Hydrophiles’ Pacific Northwest Water Research Symposium, April 23-24, 2018. Feel free to check out past Symposiums here. Additionally, to hear more about Carolyn’s journey through graduate school, you can listen to her interview on the Happie Heads podcast. 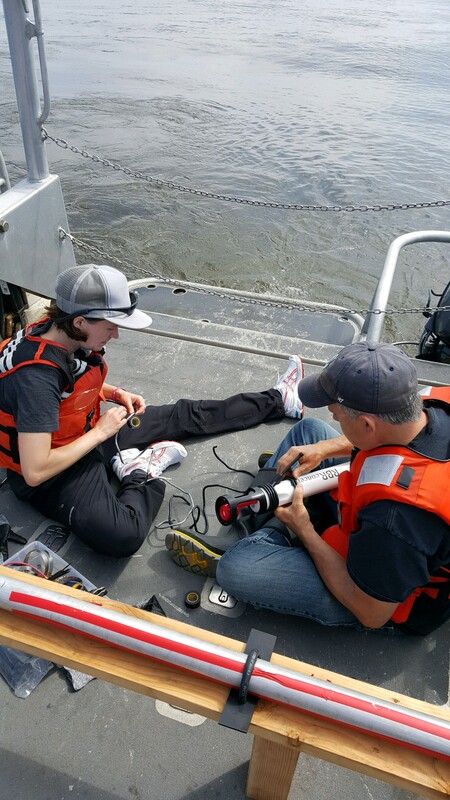 Carolyn conducting field work on the Willamette. Carolyn Gombert wrote the bulk of this post, with a few edits contributed by ID hosts. 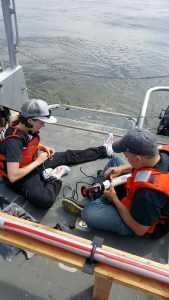 This entry was posted in College of Earth Oceanic and Atmospheric Sciences, Fisheries and Wildlife, Water Resources Management, Water Resources Policy and Management and tagged fisheries, Geomorphology, Willamette River on 2017-08-19 by klaseks.